Corporate Supporter of the Theatres TrustSt. John’s Almshouses awarded Housing Project of the Year 2018! Greenwood Projects are delighted to be providing Quantity Surveying Services for the restoration of the historic Taylor’s Bell Foundry in Loughborough which has received initial National Lottery support. Made possible by National Lottery players, the project aims to restore key parts of the Grade II* listed building which is currently on the Historic England Heritage at Risk Register. The aim is to restore the buildings, enhance the commercial operation, attract more visitors and increase awareness and understanding of the importance of Taylor’s. Development funding of £298,600 has been awarded by the Heritage Lottery Fund (HLF) to help the Loughborough Bellfoundry Trust progress the plans. This is the first phase in a bid for £3.7 million from the HLF, which it is proposed will be matched with funding from a number of sources including a fund raising campaign which will be launched shortly. Subject to a successful second round bid, work is expected to start on the Bellfoundry in 2020. There will be a wide range of opportunities for people to be involved with the project at the Bellfoundry, including heritage craft workshops, volunteering and arts and cultural events. 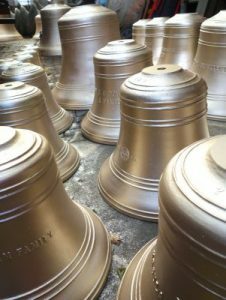 Taylor’s is the last bellfoundry in Britain, the only vestige of an ancient industry that creates bells for thousands of buildings around the world. At least 20 million people in Britain and hundreds of millions worldwide will hear a Taylor bell every day. However, the purpose-built Victorian bellfoundry is At Risk. Without urgent repairs and fundamental changes to engagement, we will lose this incredible asset and part of our culture; a massive loss to traditional craftmanship and a seismic impact on historic buildings around the world. This project will; save the site, removing it from the HAR register, secure the future of the industry in Britain and its unique skills, create a National Bell Museum, improve global engagement and ensure Taylor bells are enjoyed by future generations across the globe. If you would like to support the project please follow the facebook page or twitter feed (Twitter: @Lborobelltrust, Facebook: facebook.com/lborobelltrust).